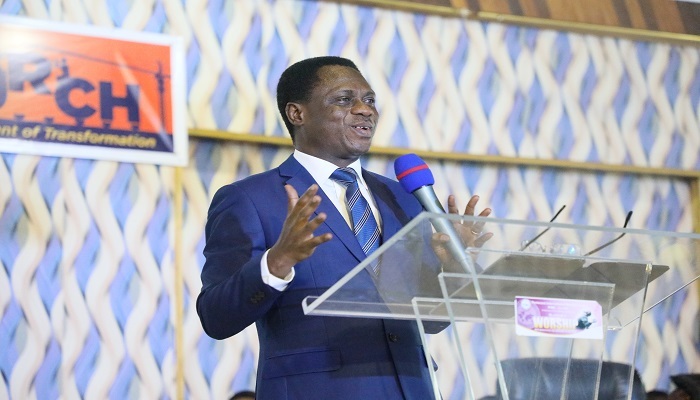 The Chairman of The Church of Pentecost, Apostle Eric Nyamekye, has debunked the assertion that the power of God is no more present in the church, thereby making it ineffective to cause real transformation in the life of Christians. “There is life in the church and we must create the atmosphere for the Spirit of God to come and operate in His church. The power of God doesn’t just come when we meet as a church, it has to be brought forth by spirit-filled people. “Just as the Ark of Covenant couldn’t move by itself and had to be carried by men, we must carry the presence of God to church and then the power of God will take over the entire service. It is by this that people will go to church and leave imparted and transformed having experienced the real power of God,” he stated. The Chairman said this in a sermon on Saturday, March 23, 2019, at the M. K. Yeboah Memorial Temple at Asafo, Kumasi during the Bompata Area 2019 Apostolisation (Officers Retreat). He challenged officers of the Church (elders, deacons and deaconesses) who are the frontline leaders of the local churches to be carriers of the presence of God in their ministry so as to keep the Pentecostal fire ablaze at their local assemblies. According to Apostle Nyamekye, the failure of church leaders to carry the presence of God to church has given cause for some people to wrongly claim that the church has lost its power/life, because people go to church and do not experience the supernatural power of God. He, however, stated that the presence of God can leave the church at the blind side of leaders and make the church an ordinary social group if care is not taken to give the Holy Spirit His rightful place to operate in the church. Reading from Psalm 95; 2 Chronicles 5:10; John 4:41; Luke 4:22, 24:32, 6:12; Hebrews 9:1ff, among other scriptures, the Chairman noted that when the presence of God erodes the church, legalities and personality show take over the church, where people come to church just to meet personalities like pastors and see others perform instead of coming with an expectation to meet God. He explained that the vibrancy of a local church depends largely on praying officers who are full of life (power of God) and impart the members with it. He, therefore, admonished church officers to ensure that the devil does not have a field day in the church to destroy things, but watch and pray always in order to keep the life of the church. The Chairman indicated that the failure by the Priests and the elders of Israel to keep a proper watch over the Ark of Covenant resulted in a disaster as the jar of Manna and the Rod of Aaron which represented the word of God and His presence went missing from the Ark. This, he said, can also happen to the church if prayer and devotional life of the officers and the members, in general, are taken for granted.